The team behind the popular Pixelmator photo editing app for iOS and Mac today announced plans to unveil an all new pro-level app, Pixelmator Pro. 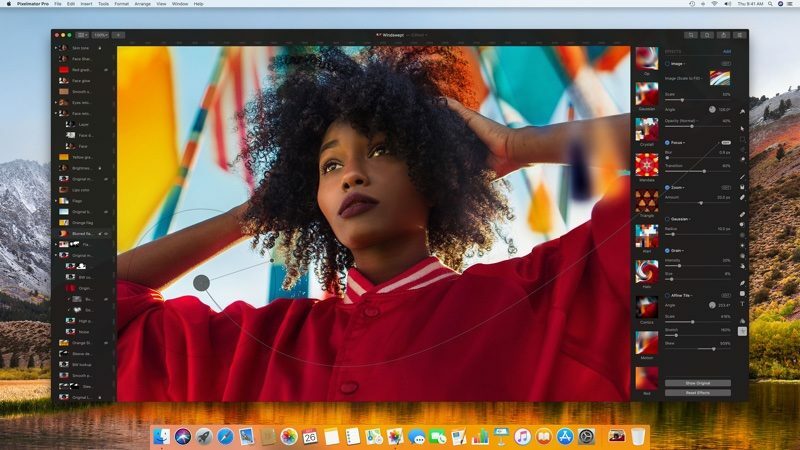 According to the Pixelmator Pro teaser site, the new software features a reimagined editing workflow, simplified editing tools, and intelligent image editing features powered by machine learning. Pixelmator Pro takes advantage of the new Core ML framework built into macOS High Sierra to provide features like automatic layer naming based on layer content, automatic horizon detection, an improved repair tool for removing objects from photos effortlessly, and a quick selection tool that's better than ever. The interface includes tools designed to make it easy to resize and rearrange layers, with a nondestructive Arrange Tool, smart spacing guides, and advanced alignment tools for aligning several objects with a click, plus there's a new painting engine powered by Metal 2 and dynamic paint blending technology. Nondestructive color adjustment tools let you edit the colors in photos, there are a selection of effects that can be added to each layer and combined in Recipes, and there are shape tools, drawing tools, layer styles, and more. All in all, Pixelmator Pro includes more than 40 tools to work with. Pixelmator Pro will be available sometime this fall. Prospective customers can sign up to get an email when the software launches on the Pixelmator Pro website. Re: upgrades. As I see it this is just a teaser announcement. Upgrade pricing, if any, will come at the actual announcement. BUT c'mon Pixelmator is $30 or less. It's been on sale for as low as $15 AND it's very easy to get iTunes Gift Cards at 15-20% off. So my gut says there will be no upgrade pricing and I'm 100% OK with that -- you should be too. Devs need to make money on upgrades otherwise they have no incentive to update their programs. $30 is a freaking bargain for what Pixelmator does. $30 is a freaking bargain for what Pixelmator does. Agreed. Pixelmator is an incredible tool, and it's damn cheap. Adobe would happily charge you that price every month for Photoshop. Argh. I really like Pixelmator but I use Windows as my daily driver now, and really missing Pixelmator. I can totally understand their mission being a macOS-only one, but damn it...is it too much to ask for a Windows release?! As stated in this article, Pixelmator relies on a lot of core OS X (sorry “macOS”) technologies, so it can’t translate to Windows without pretty much rebuilding the app from scratch with equivalent Windows technologies, where they exist, or rebuilding them where they don’t. You’d then have the ongoing drain of maintaining cross-platform comparability which would impact cost, rate of development, stability and bugginess all negatively for Mac users. Pixelmator is just one of those fantastic Mac-only apps that shows what the Mac platform is capable of when in the hands of some switched-on Mac developers. The green Apple slime parts and another greedy head arises from the mirky Apple waters. Apple theory never fix the old. re-package add something small call it new raise the price.Pitiful!! Do you know how long Pixelmator has been out without asking users to pay for a single update, of which there’ve been many? I can’t even remember how many years it’s been since I bought it. Pixelmator is about as good to the customer as you can get yet you find a way to call them greedy slime? Unbelievable! I have no need for a Pro image editor but if I did I’m sure Pixelmator Pro will offer very good value and support. Acorn 6 supports that, FWIW. Text along anything is so 20th century. Don't you know Emoji's are the new text, no path required because it's users are hopelessly lost. </sarc>. I don't get why this new version is being promoted as a separate PRO application? Is their current Pixelmator not *intended* to be used by professionals? Why not just upgrade the existing version with the new features? Bad time for their website to go down. Personally I'll stay away. After a few years of waiting for a Pixelmator interface which is not made up by miniscule icons in dark grey on a black background, I've given up on the company. Not all of us sit in a completely dark room with screen brightness on "Sun in your face" when we work. Small icons let you have more screen space for photo editing, and dark controls let your eyes focus on the photo better. Looks amazing. Real competition in this space is wonderful and we need companies to bring the fight to Adobe and their monopoly and savage pricing. 1. Don't be afraid to charge real money for this. If the software is great, people will pay for it. Yes, cheap fools will complain on Twitter and Apple chat boards. Ignore them. We need great software and the only way we will get it is profits. 2. No subscriptions. Charge one price. Charge for upgrades when the product makes a big leap in features. But subscriptions play right into what we hate about Adobe, even if it's cheaper. Look at the iCal icon in the dock. it says October 26. It might be the release date! Very excited!